Whether you're interested in economic development (small business loans), community development (non-profit loans), or education (student loans), you can run your own microloan program, while LoanWell manages all the back office details! Want to learn more? Chat with us about the program in detail. The Service Partner's job is to run the marketing for the microloan program and generate application submissions. Typically the Service Partner's core services are in alignment with the financial access offered to the applicants. This could be a non-profit, school, organization, municipality, etc. The Capital Partner's job is to raise the capital to fund the microloan program. Typically the Capital Partner's core services or development efforts are in alignment with the financial access offered to the applicants. This could be a local bank, organization, church, government, philanthropists, etc. These two organizations collaborate on program goals and the LoanWell team sets up reporting and periodic questionnaires to measure impact. One organization could fill both service and capital partner roles if desired. The Service Partner markets to local community with microloan opportunity. We collect application submissions based on your custom application questions. The program partners choose recipients of the microloan. 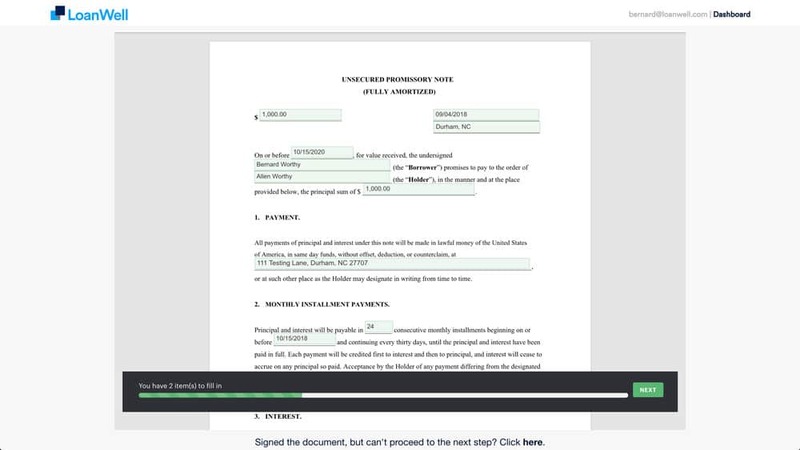 Recipients sign your custom loan agreement electronically on our site. 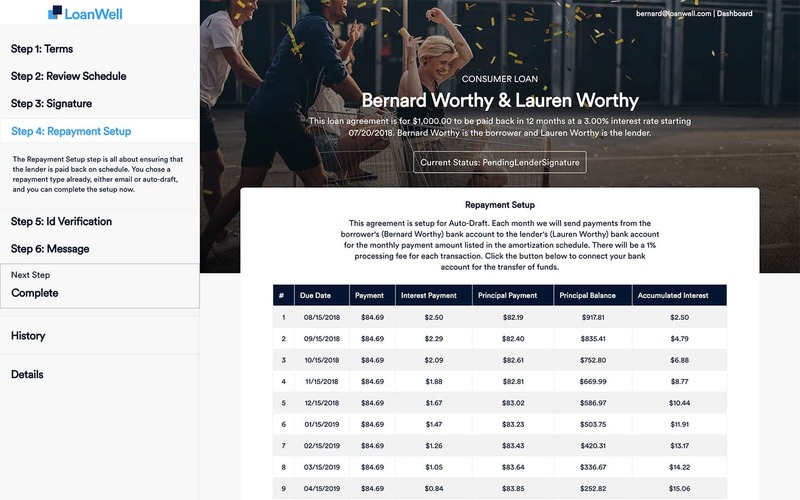 A repayment schedule is generated for all parties and the recipient links their bank account. Once that is completed, the loan principal is disbursed to the recipient's bank account. Monthly auto-drafted payments are scheduled for repayment from recipient's bank account to the loan disbursement bank account. We take care of the repayment, so the partners can focus on program goals and results. LoanWell guides the applicant during each step of the process with simple questions. The program lead can customize the application to best fit the target audience. 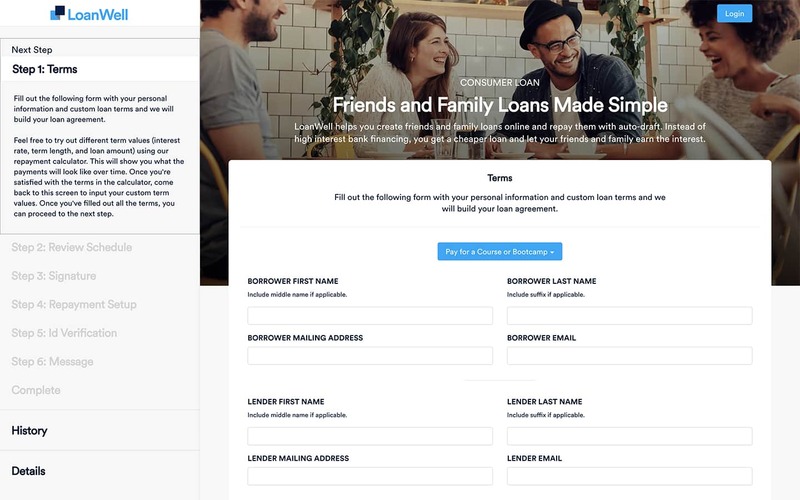 With LoanWell, the borrower can sign the loan document and communicate with the program partners directly on the site adding convenience to the back and forth process. We've made it as easy as possible to manage the repayment of microloans with auto-drafted payments. LoanWell takes the stress out of paying back and getting paid back, so that you can focus on the program results.